Crofton Beam Engines is the oldest running steam engine in the world. It was built two hundred years ago to supply water to the highest point of the Kennet & Avon canal. There are two beam engines, including an original two hundred year-old engine that was manufactured by Matthew Boulton and James Watt. The site has become a visitor's centre, which is open everyday between the 9th March - 6th October. 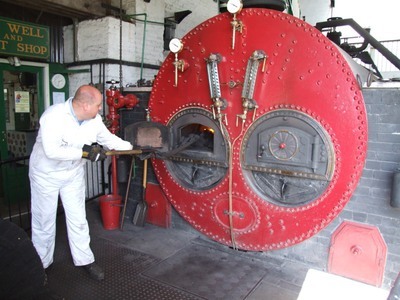 While there, you can see the coal-fire boiler being stoked by hand, appreciated the magnificent pieces of industrial archaeology, and have a bite to eat at Engineman's Rest Café. For the first time, this year Crofton have set up a series of Steam Experience Days for those who want a chance to get in on the action. You can book a place costing £100, and get a hands-on experience of operating the engines. Alternatively, you could join their crew of volunteers, where you will be able to operate the boiler and engines on steaming days. There will be all sorts of classes to participate in, such as planting bulbs & flowers, homecraft, and photography. And for the kids, there will be Easter card making and egg decorating, not to mention an Easter egg hunt on the 31st. To book call 07530 290700. Tickets on a normal day are free for children, £4.50 for adults and £4 seniors, while on Steaming Days admission is £8 and £7 respectively. This is actually a pretty good deal because if you buy a ticket on a steaming day, you get free admission for the rest of the year.